Calm your dog’s Energy and behavioral problems disappear! One of the main issues I see that is tremendously lacking in thousands of homes, as I behaviorally rehab dogs and instruct their owners, is the simple understanding that dogs communicate constantly through their energy and body language. Dogs are almost always talking! Are we accurately reading them and honestly listening? Dogs are constantly telling us what they need or want and this, in turn, tells us how to help them. And the amazing thing about that is that dogs don’t lie. They don’t deceive or fall prey to mankind’s greatest weaknesses, such as inflated ego, criticism, materialism, consumerism, or attempting to live a life that flows against Mother Nature. When we can take our eyes off ourselves for a moment we can truly see, appreciate, and then help a dog or pup in need. If you begin to think of a dog as furry energy, you will start to see how you can help calm that animal’s brain in that moment in time. This is the answer to any dog behavioral issue. Problems arise when most typical dog trainers, dog behaviorists, vets, vet techs, dog rescue groups, groomers and other dog professionals do not use enough natural calming techniques. Many dog professionals seldom consider how dogs need to be calmed down in order to be social, and instead just forge ahead with the same typical training techniques no matter what the dog is communicating with its energy and body. Typical training uses way too much excitement. Please re-read that last sentence. We have been sold the concept that an excited dog is a happy dog. In many circumstances nothing could be further from the truth. When we realize that the canine uses differing levels of excitement/energy like a human uses words to communicate, we start to understand that being excited does not always mean the dog is happy. In fact, many dogs are overexcitement junkies. They are stuck in horrible habits of overexcitement because they have not been shown how to stop the addiction, or shown they have crossed a social boundary in the household. Remember, not all excitement is good. Playing ball or wrestling with your dog is good excitement. Pulling nonstop on leash or freaking out at another dog or person is not good. As humans, we get excited to go on vacation and that’s great but we also become excited when in a warzone or if we were running from a dangerous murderer. Not all excitement means we are happy. Most training also seldom considers what the animal may actually need and instead goes right into manipulating the dog, usually using something exciting (treats, toys, praise), into a sit, down or stay. Behaviorist and trainers alike focus on the External motivation of the animal instead of the more natural and much more beneficial Internal motivation. They focus too heavily on obedience as the end-all-be-all instead of relationship! We as a society are hyper fixated for some very odd reason with making our dogs sit. I see countless people every day making their dogs sit and sit and sit some more. I ask you this simple question…Why? Has it solved the dog’s behavioral issue? Has it made them calm their energy enough to change the undesirable behavior into something much better. or do they just end up, literally, placing their bottom on the ground for a moment and only to pop back up into whatever behavior they want? Or, if the “sit, stay or wait,” works and is fairly strong and the person has practiced that with the dog and done prior training, the dog will then remain in the “sit, stay, wait” yet all the while building more energy and over-excitement. Then, when the owner releases the dog, the dog ends up still exploding forward into the undesired behavior! What has the sit (stay, wait) done for you? What was gained? In many cases the dogs use it to manipulate and raise their energy which is the OPPOSITE of what the owner wants and what the dog wants deep down inside. Instinctually, no dog wants to be hyper or out of control. They are just locked into a habit of raising their energy. Many dogs I see yearn for more natural rules and boundaries so they can learn how to calm themselves down and exist more comfortably with their families at a more sociable level. This leads to more pleasant outings and a larger social group. And, as we know, instinctually for a pack predator (with amazing instincts right from the wolf) getting along in a large social group and operating like a well-oiled-machine is what being a healthy dog is all about. Being social is the key. But you have to be calm enough to get along socially! Consider your dog’s energy levels while patiently existing in the moment with them, read their body language more effectively and then you will have an amazing foundation to prevent or cure any behavioral issue. Think and then act to intercept rising energy and place your dog or pup into more patient postures. Hope you all enjoyed this article. 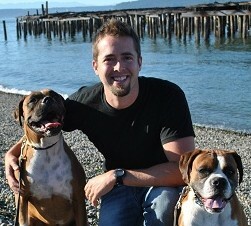 Check out my website at www.gstevensdogtrainer.com Stay tuned for other excellent dogformation from yours truly, thecaninecalmer. Look for little dogortunities to work with your dogs or pups throughout the day. Order my behavioral book, Dog Myths -it’ll rock your world and give you an amazing understanding of dog language and how the training industry is dropping the ball and how to prevent, reverse, and eliminate behavioral issues. The link is below. And, be different, use calmness instead of excitement when working with your dog or pup! Author of Dog Myths: What you Believe about dogs can come back to BITE You! I copied and pasted this to my community here in Maryland for the List Serve. There are so many dogs, and perhaps this will help someone. So well written. Kathie G. Balto. Thanks, Kathie! Be sure and click the Follow link to get direct access. It just means when we post a new article it will appear in your email and you can read the short post at your leisure! HI. Thanks for your comment. I wasn’t sure where to place this comment, so if this is in the wrong place, apologies. I clicked to your website and I noticed that your company says, “Any dog, any breed”. That’s just one thing that I have to disagree with. While I do agree that all dogs need “calm”, and that training is better when done calmly, and the dog gets more out of it without all the excitement, I believe that not all dogs of all breeds can be trained to not be aggressive unpredictably. It is my belief that some dogs, and some breeds are unpredictable. And this is why I believe it. Most dogs, probably 99 percent of them, will protect their owners, even with their own lives. However, there are just a couple of breeds , that have been in the news lately and over the past few years –and they are in the news because they have killed , and attacked their own owners –all unprovoked attacks. So when a breed becomes known for that, I am of the understanding and belief that this particular breed can be highly unstable, and therefore not fit for training the aggression out of the particular dog/breed. I do realize that not everyone agrees with this comment. I am just expressing my opinion here. Thank you. Thanks for the feedback. And, yes, it makes good common sense…unfortunately I know (because many of my clients tell me this on an almost weekly basis) that many training companies do Not practice this balanced, natural, common sense approach to working with animals! I don’t have a twitter…yet! But as we explode with growth in our company the sky is the limit and I can easily see that happening. My next phase (when I have time- almost never- but I’m working on it) will be to get videos going on natural calming methods and finish my book. Thanks for the input. ages. Great stuff, just excellent! Thank you so much for the great feedback, Linnie! Be sure to follow as we are growing and working on a book and videos!! Looking forward to new tips! I’ll be calling for some one on one help. I don’t have an iProduct to download the book….. necessary, yes? Hey Cassandra, sorry for the late response – we’ve been quite busy having more children and building our dog business. You could order Dog Myths right from Amazon and get yourself the paperback or go to your local book shop and have them order one in for ya! Hope this helps and thanks so much for commenting. We actually just booked a Book signing event in University Place for Sept 29th. I will also give a little seminar on how to rightly relate to our dogs so that food treats and harsh handling become largely unnecessary and frivolous!